American theaters are about to get a whole lot wetter, said every uncreative studio executive. 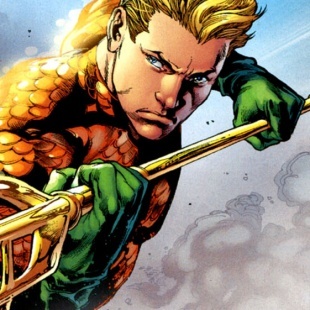 It would appear that the Aquaman movie is definitely happening, and that Warner Bros. is fast-tracking it, at least according to The Hollywood Reporter, which reported this afternoon that two screenwriters - Will Beall and Kurt Johnstad - have been hired to write screenplays for the in-development film. That's sceenplays, plural. THR also reports that Beall and Johnstad have been hired as part of a process called "dual tracking", a recent studio trend by which two separate scripts are written simultaneously. The idea being that once completed, the studio finds what it considers to be the best possible version between them. The process, already employed for WB's upcoming Tarzan revival, is said to allow for faster turnaround on scripts, useful for productions working on a tight schedule, which Aquaman undoubtedly is. Warner Bros. recently revealed an ambitious release schedule for its line of DC Universe live-action films, but that reveal did not include what these films will end up being. Only the first of these films - March, 2016's Batman v. Superman: Dawn of Justice - has so far been announced. Every other slot on the release schedule is currently filled by "untitled Movie". This could be because Warner Bros. is, for some inexplicable reason, choosing to save its announcements for some later date. Then again, it could also be because these untitled films aren't yet far enough along in production to know what release dates are realistic. But something needs to be in production soon: the next release date the studio has staked out after Batman v. Superman is 08/05/16, a mere 5 months later. If it doesn't yet have that film in production, it's going to have to move quickly. We'll just have to keep guessing though. As of this writing, Warner Bros. has declined to comment on these reports. It also has not yet confirmed the existence of an Aquaman film, though it is popularly understood that former Dothraki Jason Momoa has been cast in the role, which will be debuted in a cameo during Batman v. Superman. Personally, this sounds like a great idea to me. Kind of like how having one person cook pancakes and another person cook soup, then combining both into a single meal always yields delicious results, no doubt the best possible version of the future Aquaman script is forthcoming.